IMAGE: This image shows a fragment of the calf scull. 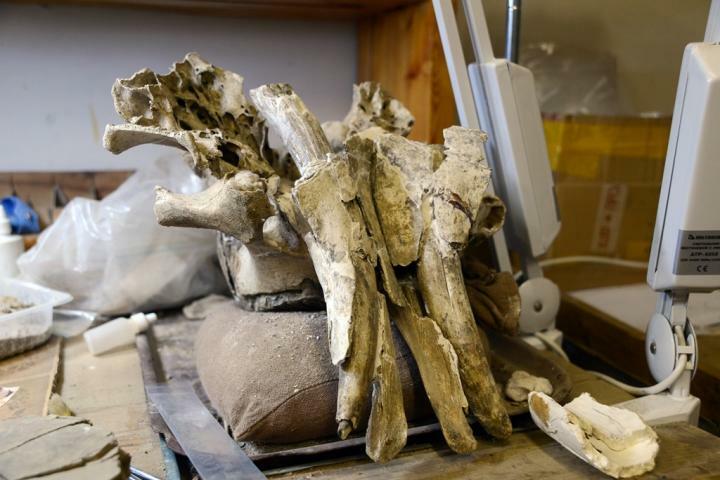 Researchers around the world try to find out causes of extinction of the most prominent representatives of late Pleistocene megafauna – the mammoths. There are two main versions: 1) changes in microclimate and anthropogenic pressure, and possibly simultaneous effect of both factors. There are other much less popular theories of their extinction: 1) infectious diseases or 2) fall of celestial bodies. However, hardly anybody has paid attention to geochemical changes of environment where Mammuthus primigenius lived. Investigating remains of late mammoths, we frequently find obvious signs of skeletal diseases such as: osteoporosis, osteofibrosis, osteomalacia (softening and bending of bones), arthrosis, and other joint diseases – says Sergei Leshchinsky. He also underlines that articular surface of extremity bones of some individuals are not only harmed but damaged and mutilated by these diseases. As for osteoporosis, in separate collections we found it in 90% of cases. These diseases resulted in high traumatism of the animals; they got sprains and fractures even at very low loads. Mammoths with broken limbs or spine could not take food in sufficient quantities and could not follow herd. Such individuals died soon hunted by predators. As a result – the nature was stronger than the giant animals, and mammoths became instinct. The beast solonetz is the Russian term for a ground surface area characterized by a high content of certain macro- and microelements; as such it has a broader interpretation than “salt lick”, “mineral lick” and “mineral source”. Within the confines of the beast solonetz, animals eat soil and rocks and drink mineralized water from springs to maintain homeostasis, which is equivalent to the definition of “lithophagy”. At the highest moment of mineral starvation they became some kind of activity hotbed of mammoths and other large mammals. The particular vulnerability of mammoth in mineral starvation can be reflected in specific mammoth “cemeteries” of the late Pleistocene. The analysis of the clinical picture of the diseases deserves special attention -how rapidly did the disturbances in homeostasis and the formation of osteodystrophy occur in unfavourable geochemical conditions? Based on this study, it appears that the destructive changes developed rapidly: extensive bone pathologies such as those found in the Taymyrskiy mammoth or in the Shestakovo-Kochegur, Berelyokh, Lugovskoe and Krakow Spadzista Street mammoth populations are incompatible with along developmental period. Under conditions of smaller and fewer geochemical oases and predominantly snow or acidic swampy-ground waters as drinking water in the winter, the “later” mammoths may have suffered from chronic mineral deficiency for 6- 10 months a year. It is highly probable that this severe natural condition lasted for more than 15 thousand years and may have proven fatal for the largest representative of the terrestrial fauna at high latitudes, – Sergey Leshchinskiy said. – The wool lyrhinoceros and cave bear may have suffered the same fate. Other large herbivores (bisons, horses and deer) have overcome the Holocene border, perhaps due to their greater mobility, although with a significant reduction of habitat and population size. Large cats and hyenas went extinct probably because of drastic reduction of nutritional resources at the time of the disintegration of the single “mammoth” ecosystem. The very high percentage of skeleton pathologies suggests a high murrain among mammoths, irrespective of anthropogenic impact, which could not lead to this species extermination throughout its huge territory. Man was a witness and one of the participants in the natural process of the Pleistocene megafauna’s extinction. October 27, 2015 in Environmental.